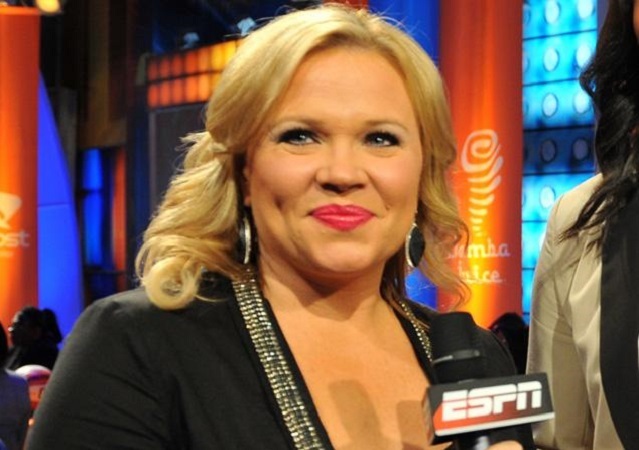 Reporter Holly Rowe returned to the ESPN airwaves in March, after taking roughly a month off for treatment on a new tumor in her chest that was discovered last spring. She continued to work while still undergoing chemotherapy treatment, getting back to reporting at the end of the college basketball season. Since then, Rowe has taken on a regular workload, pushing herself to cover as many women’s basketball events as possible during the past three months. That included working the NCAA Women’s Tournament regional in Bridgeport, Connecticut as part of UConn’s run to its fourth consecutive national championship. Rowe was in Indianapolis for the Final Four, as the Huskies beat Washington and Syracuse for the title. Being at the draft to kick off the WNBA’s 20th season was important to Rowe, as she described to Excelle Sports’ Gabriella Levine for an excellent feature on the ESPN reporter. Since then, the WNBA’s 20th season has begun and Rowe said covering the season opener was the most difficult game she’s dealt with while continuing to undergo treatment. Levine’s article obviously goes into further detail on that, which is worth your reading time. Besides Rowe’s determination and love of her work, what comes across most strongly in the piece is how much the athletes she’s covered admire her.